The Arboretum Visitor's Center is open Tuesday through Saturday from 10 a.m. to 4 p.m. and Sunday from noon to 4 p.m. The Visitor's Center is closed Thanksgiving Day and December 24 through 31. Grounds are open daily from dawn to dusk. Admission is $5 for adults, $2 for students 6-18, and free for children 5 and under. Admission is free for Adkins Arboretum members. 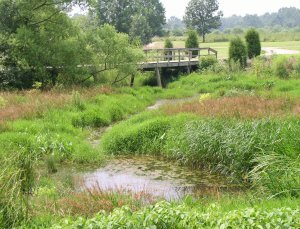 The Arboretum is centrally located on Maryland's Eastern Shore, 25 miles east of the Chesapeake Bay Bridge at 12610 Eveland Road, near Ridgely, MD. The Arboretum is adjacent to Tuckahoe State Park, which offers tent and cabin camping, picknicking, boating, fishing, and canoe and kayak rentals. Take U.S. 50 to U.S. 404. Turn left onto U.S. 404 and go approximately 7 miles to the second stoplight at MD 480. Turn left onto MD 480 and then take the immediate first left onto Eveland Road. The Arboretum is 2 miles ahead on the left. From I-95, take the exit for U.S. 896 South. U.S. 896 will become U.S. 301. Continue on U.S. 301 to Centreville and turn left onto MD 304. At Ruthsburg, turn right onto MD 481. Go two miles and take the first left onto Crouse Mill Road, which will take you to Crouse Mill Lake. Continue on Crouse Mill Road to Eveland Road, the first road on your right after the lake. Turn right onto Eveland Road. The Arboretum is ¼ mile ahead on your right. 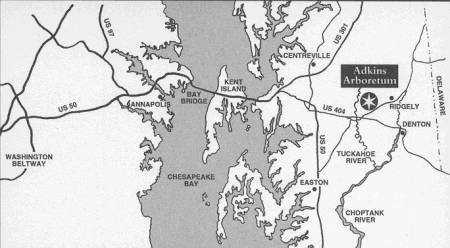 Take MD 304 across U.S. 301. Continue on MD 304 to Ruthsburg and turn right onto MD 481. Go two miles and take the first left onto Crouse Mill Road, which will take you to Crouse Mill Lake. Continue on Crouse Mill Road to Eveland Road, the first road on your right after the lake. Turn right onto Eveland Road. The Arboretum is ¼ mile ahead on your right. From north of Easton on U.S. 50, take Cordova Road (MD 309) to MD 404. Turn right onto MD 404 and go to the first stoplight at MD 480. Turn left onto MD 480 and take the immediate first left onto Eveland Road. The Arboretum is 2 miles ahead on the left. From Route 13, take MD 404 West. Turn right onto MD 480 and take the immediate first left onto Eveland Road. The Arboretum is 2 miles ahead on the left. Visit Google Maps for detailed maps and complete driving directions.